On stage at Google’s hardware event in San Francisco on Wednesday, hardware chief Rick Osterloh put the current state of smartphones in 2017 best. “Smartphones might be reaching parity in terms of specs,” he said, and that line of thinking was apparent when Google didn’t bother to mention the specs of the Pixel 2 or Pixel 2 XL at any point during its reveal. With that mentality in mind, how do smartphone manufacturers like Google, Apple, and Samsung differentiate themselves? 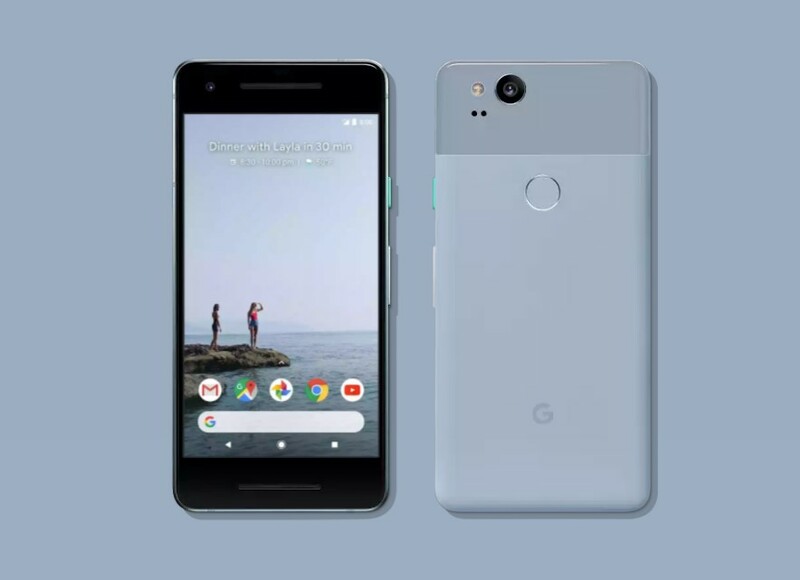 For Google, it means making the Pixel 2 the singular device that connects the entire Google ecosystem. Last year Google CEO Sundar Pichai dialed in on the company’s focus on artificial intelligence moving forward, and with Google’s AI now boasting the highest IQ of any AI platform on the planet, the tech giant is ready to truly incorporate its Google Assistant throughout its entire product line. “AI + software + hardware”. That’s the tagline that kept flashing on the screen throughout the event, and Pixel 2 exemplifies it. Like Osterloh said, the premium smartphone market is becoming a flat playing field, and a quick look at the tech specs of the Pixel 2 confirm it. But where Google continues to differentiate itself on the hardware front is the camera. When the Pixel launched last year, it found an audience looking for the best smartphone camera available, and Google has continued to push that selling point with the Pixel 2. The Pixel 2 has the highest DxO score of any smartphone ever with 98, compared to the Pixel that launched with a score of 90, and the Galaxy Note 8 and iPhone 8 Plus that have launched with scores of 94 respectively. This may not mean much to most users checking out the Pixel 2, but from my brief experience with the device, it is clear that Google continues to have a fantastic camera experience. Both versions use the same cameras: a 12.2 megapixel rear camera with autofocus, laser and dual pixel phase detection, and f/1.8 aperture; and an 8 megapixel front camera with fixed focus and f/2.4 aperture. Google has added electronic image stabilization for more clarity, optical image stabilization, minor updates like wider aperture, and the rear camera can shoot video in 4K at 30 fps. 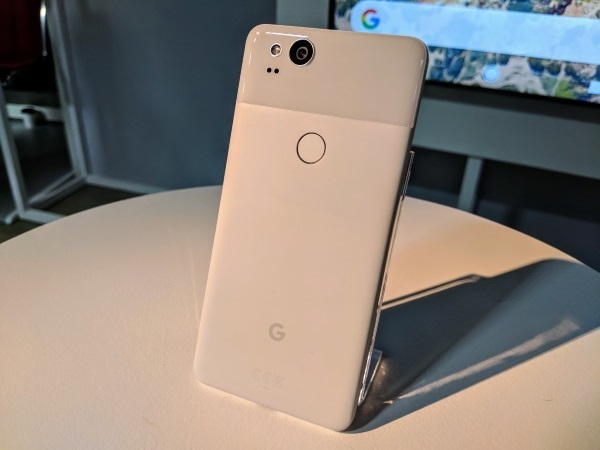 However, you’ll notice that there is only one rear camera on both Pixel 2 devices, rather than the dual rear camera approach that seems to be the popular route to take in 2017. Google has instead opted for a dual-pixel camera sensor approach that can impressively do with one camera sensor what many others need two camera sensors to do. This means that both the rear and front cameras on the Pixel 2 and Pixel 2 XL can achieve that DSLR-blur effect, which Google is calling ‘Portrait Mode’ on the Pixel 2. Other camera features include ‘Motion Photos’, basically the same as the iPhone’s Live Photos that automatically records video around each picture, and new augmented reality stickers. This AR stickers are based on Google’s ARCore framework and allow you to incorporate stickers in any photo or video. Google used the Stranger Things ‘demogorgon’ for its demo, but has also teamed up with Saturday Night Live, YouTube, the NBA, and Star Wars Ep. 8 for more when it launches later this year. I expect we’ll see that the Pixel 2 will continue to lead the pack in regards to camera performance. Navigating around the dual rear camera approach certainly gives it an edge, especially when the price is brought into the discussion. With my brief time with the device in a poorly lit event space, it’s clear that users who are accustomed to taking photos at conferences and events where lighting is not optimal will be satisfied. 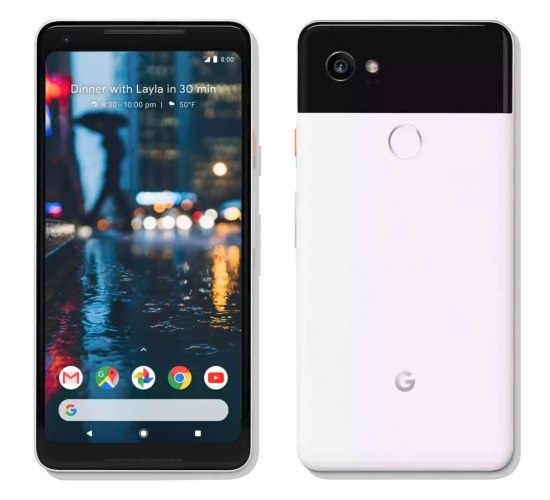 While the two Pixel 2 devices share most of the same specs, the big differentiator is the display, with the most notable difference being the large bezels incorporated on the regular Pixel 2. Google has taken a similar approach to Apple and the iPhone 8 versus iPhone X by keeping the bezels on the smaller handset. Ultimately, it will be up to user preference between the two devices. Want the slightly higher resolution OLED screen? Choose the Pixel 2 XL. Indifferent? Then go for the Pixel 2, the AMOLED screen isn’t anything to frown at. Lastly, it should be mentioned that Google has gone the way of Apple and given credence to the whole ‘the future is headphone jack free’ that Apple tried starting last year. That’s right, both Pixel 2 devices lack a headphone jack, for seemingly no reason at all. To make up for this, Google introduced its own wireless headphones called Pixel Buds. And while the Pixel Buds are sure to attract comparisons to Apple’s AirPods, Google has taken the wireless headphone concept one step further: live translation. Using Google Translate, Pixel Buds users – the headphones can work with any device – can translate up to 40 languages in real time. This is a huge reason to pick up the Pixel Buds, especially if you’re often traveling on business to destinations where you may not speak the native language. A move like this makes losing the headphone jack sting slightly less. What Google is doing with Google Translate for the Pixel Buds is appropriate when you look at how big of a role Google Assistant plays in the Pixel 2 devices. The Pixel 2 has two new Pixel-only AI-powered features, Google Lens and Now Playing. Google Lens is the company’s visual search comparable to what Samsung is trying to do with its own smart assistant in Bixby Vision. Basically, Google Lens allows you to take a picture of something, like a book, and you’ll receive info on it, like who the author is and book reviews. The concept is pretty simple, but where it works compared to Bixby Vision, is that the Pixel can access the entirety that is the Google database. Having the largest search engine on the planet at its fingertips can make Google Lens an exciting feature when users can take a picture of a restaurant and get reviews on the spot. Now Playing takes advantage of the new always-on screen by automatically detecting what music is playing in the environment, and displaying the name of the song and artist. It’s an opt-in service that pulls from a Google-generated service. Basically, it’s Shazam but it’ll happen automatically. I wasn’t able to test any truly niche artists to see how well this really works, but it is definitely a nice touch, especially for those like me who can never remember the name of a song, let alone who sings it. Other additions to Google Assistant are smaller updates designed to make the entire process less of a hassle. While being able to squeeze the Pixel 2 in order to launch Google Assistant isn’t the biggest improvement, Google showed off some useful functionality during the reveal event. 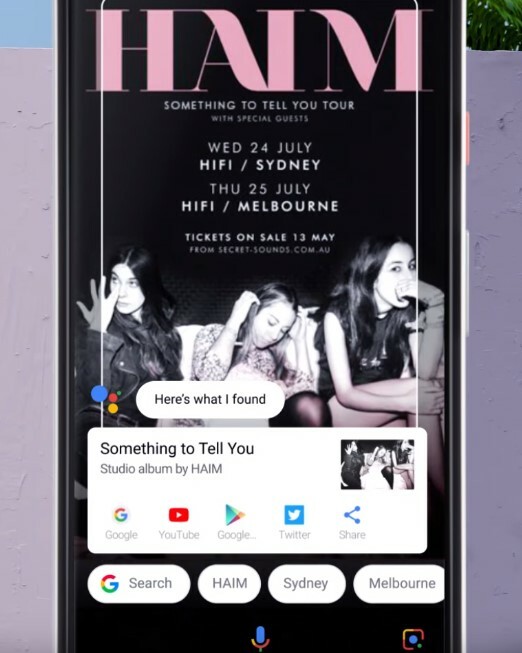 For example, Google Assistant can recognize when you are entering your car and placing your phone in your cup holder, so that with just one question it can direct you home, tell you the traffic, start playing the podcast or radio station you were listening to, and list any unread messages you’ve received. You could say that this is one step closer to digital assistants like Google Assistant actually becoming your assistant. And Google Assistant works seamlessly with the rest of the products in the Google family. With instant tethering, you can use the Pixel’s data connected to access the internet on the Pixelbook, and your Google Home device can send information to your Pixel. Google implemented ‘Fast Pair’ so that its devices can connect to each other over Bluetooth even faster. With the added functionality of Google Assistant, and how heavily embedded it is in the Pixel 2 devices, this brings up obvious privacy concerns. For Google Assistant to work exactly as designed, you’ll have to give it access to everything you do on your phone. These artificial intelligence systems need data to learn and grow to become useful, and if it’s going to be tailored to you, there is no way around giving it access to all you do. With Google Assistant, Google is able to build a profile of who you are, and naturally, that will extend to the likes of targeted ads. So while these features may be extremely convenient, this is certainly something to think about before picking up the Pixel 2. Just like with the Pixel, the Pixel 2 will be one of the first devices to receive Android updates. The Pixel 2 will be the second phone to launch in Canada with Android 8.0 Oreo installed (the Sony Xperia XZ1 is the first), and again, just like its predecessor, it remains one of the cleanest Android experiences available. I’ve never been a fan of the baked in third-party apps the likes of Samsung, LG, and others like to include, forcing me to go through the paces to remove each of those shortcuts, and replace them with the Google apps I use regularly. I appreciate that I don’t have to bother with that on the Pixel devices. The Pixel 2 has moved its all-purpose Google search bar that can search locally and on the internet to the bottom of the screen. Replacing it is something called ‘At a Glance’, which displays relevant info about your day like meetings, flight status, or traffic. Pixel 2 users also get unlimited Google Drive storage for storing pictures. No additional costs whatsoever. The Pixel 2 devices support Google’s ARCore for the AR/VR content that will inevitably come with that. It’s also compatible with the Google Daydream. At first glance, Google has set itself up to have another winner with the Pixel 2 and Pixel 2 XL. It once again has a winning camera that photographers are sure to enjoy, and it truly feels like the first smartphone to champion what AI can do. AI + software + hardware indeed. 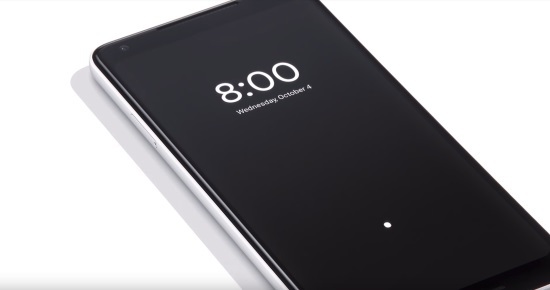 The Pixel 2 is scheduled to ship on Oct. 17 at $899 for the 64 GB model and $1,029 for the 128 GB. Meanwhile, the Pixel 2 XL is scheduled to ship in late November at $1,159 and $1,289 for the 64 GB and 128 GB models respectively.